Louis-Nicolas Dabout, Duc d'Auerstädt, and prince of Eckmühl, marshal of France, was born at Annoux (Yonne) on the 10th of May 1770. His name is also, less correctly, spelt Davoût and Davoust. He entered the French army as a sub-lieutenant in 1788, and on the outbreak of the Revolution he embraced its principles. He was chef de bataillon in a volunteer corps in the campaign of 1792, and distinguished himself at Neerwinden in the following spring. He had just been promoted general of brigade when he was removed from the active list as being of noble birth. He served, however, in the campaigns of 1794-97 on the Rhine, and accompanied Desaix in the Egyptian expedition of Napoleon Bonaparte. On his return he took part in the campaign of Marengo under Napoleon, who placed the greatest confidence in his abilities, made him a general of division soon after Marengo, and in 1801 gave him a command in the consular guard. 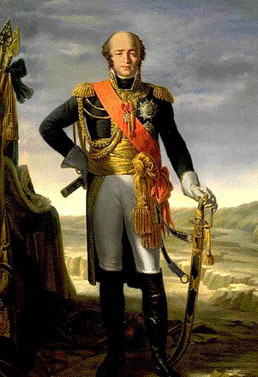 At the accession of Napoleon as emperor, Davout was one of the generals who were created marshals of France. As commander of the III corps of the Grande Armée Davout rendered the greatest services. At Austerlitz, after a forced march of forty-eight hours, the III corps bore the brunt of the allies' attack. In the Jena campaign Davout with a single corps fought and won the brilliant victory of Auerstädt against the main Prussian army. He took part, and added to his renown, in the campaign of Eylau and Friedland. Napoleon left him as governor-general in the grand-duchy of Warsaw when the treaty of Tilsit put an end to the war (1807), and in 1808 created him duke of Auerstädt. In the war of 1809 Davout took a brilliant part in the actions which culminated in the victory of Eckmühl, and had an important share in the battle of Wagram. He was created prince of Eckmühl about this time. It was Davout who was entrusted by Napoleon with the task of organizing the "corps of observation of the Elbe", which was in reality the gigantic army with which the emperor invaded Russia in 1812. In this Davout commanded the I corps, over 70,000 strong, and defeated the Russians at Mohilev before he joined the main army, with which he continued throughout the campaign and the retreat from Moscow. In 1813 he commanded the Hamburg military district, and defended Hamburg, a city ill-fortified and provisioned, and full of disaffection, through a long siege, only surrendering the place on the direct order of Louis XVIII. after the fall of Napoleon in 1814. Davout's military character was on this, as on many other occasions, interpreted as cruel and rapacious, and he had to defend himself against many attacks upon his conduct at Hamburg. He was a stern disciplinarian, almost the only one of the marshals who exacted rigid and precise obedience from his troops, and consequently his corps was more trustworthy and exact in the performance of its duty than any other. Thus, in the earlier days of the Grande Armée, it was always the III corps which was entrusted with the most difficult part of the work in hand. The same criterion is to be applied to his conduct of civil affairs. His rapacity was in reality Napoleon's, for he gave the same undeviating obedience to superior orders which he enforced in his own subordinates. As for his military talents, he was admitted by his contemporaries and by later judgment to be one of the ablest, perhaps the ablest, of all Napoleon's marshals. On the first restoration he retired into private life, openly displaying his hostility to the Bourbons, and when Napoleon returned from Elba, Davout at once joined him. Appointed minister of war, he reorganized the French army as far as the limited time available permitted, and he was so far indispensable to the war department that Napoleon kept him at Paris during the Waterloo campaign. To what degree his skill and bravery would have altered the fortunes of the campaign of 1815 can only be surmised, but it has been made a ground of criticism against Napoleon that he did not avail himself in the field of the services of the best general he then possessed. Davout directed the gallant, but hopeless, defense of Paris after Waterloo, and was deprived of his marshalate and his titles at the second restoration. When some of his subordinate generals were proscribed, he demanded to be held responsible for their acts, as executed under his orders, and he endeavored to prevent the condemnation of Michel Ney. After a time the hostility of the Bourbons towards Davout died away, and he was reconciled to the monarchy. In 1817 his rank and titles were restored, and in 1819 he became a member of the chamber of peers. He died at Paris on the 1st of June 1823.